Cold fruit soups are a great way to add fruit into your diet. Add extra creaminess to your soup with a scoop of vanilla ice cream and fancy it up by serving it with colored plastic spoons. To add variety to simple vanilla ice cream, fold in fruit sauces like rhubarb, strawberry, mango, raspberry, etc., then refreeze until firm. To make serving easy and neat, pre-scoop your ice cream on a parchment paper lined baking sheet and place in the Freezer. Serve your ice cream scoops on a waffle cone or in a bowl with frozen yogurt spoons. Get creative and present your ice cream in a frozen peach half, hollowed orange, coconut half or cream puff. 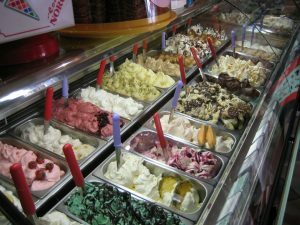 For ice cream with a Mexican twist, butter a small flour tortilla, mold it over a bowl and toast it in the oven. Let your tortilla cool before serving your ice cream. For a praline ice cream sundae, toast chopped pecans and stir in some brown sugar and finish off with some vanilla ice cream. Make your own iced café latte by adding vanilla ice cream to a cold strong shot of coffee. Then just add ice and blend until smooth. For a quickly smashed dessert, buy some crepes from your local supermarket, add some scoops of chocolate ice cream and drizzle your favorite liquor on top. 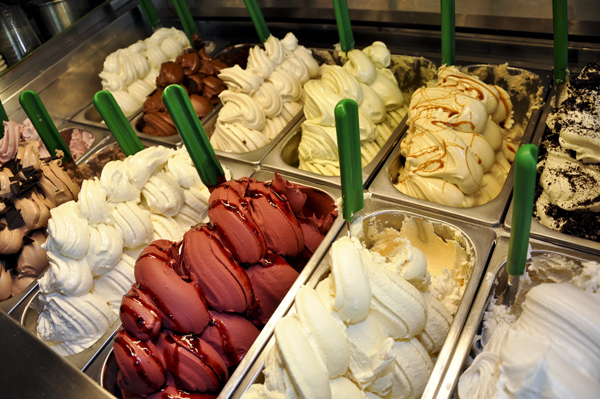 Gelato Products is a supplier of custom printed cups and spoons and other products for Gelateria owners.